The one who’s had a hard week. Who might be wondering if it’s even worth it to hope or dream anymore. The one who has to swat discouragement away like a pesky fly. I know those feelings, too. Can I lean in and gently whisper this hard truth to both of us? The riskiest thing is not to hope or dream. The only way to avoid making mistakes is to not do anything. And that’s the biggest mistake of all. The only way to avoid being hurt is to never love. And being alone in that way is the deepest wound a heart can have. The things that help us feel safe are the same things that can put us at greatest risk. You are braver, stronger, more capable than you know. And the God you serve is bigger than you’ve yet experienced. 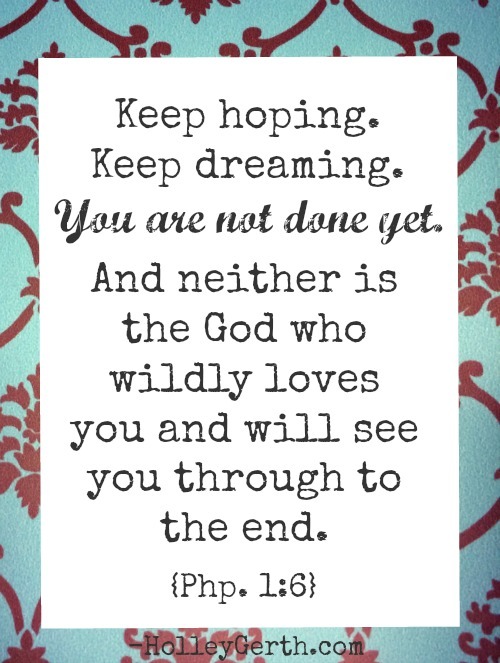 And neither is the God who wildly loves you and will see you through to the end. p.s. If you’d like more encouragement for your dreams, you can find it in my latest post on the God-sized Dreams site. P.P.S. Looking for Graduation Gifts? You’re Already Amazing, You’re Made for a God-sized Dream and Opening the Door to Your God-sized Dreams will encourage the graduates in your life! There were things I needed to work out with a good counselor, Working through the events of the last 10 years of my life and what was behind that fear to dream, I have had a breakthrough. Jumping Tandem retreat and the connections I made there was part of the journey. Beginning to take risks here and there. THANK YOU SISTER FOR THOSE WORDS!!! wow! Thanks Holley for again letting God use you as His pen to write into my life! Thank you so much for these encouragements. More often than not, they seem to be directed just to me. This has been a very challenging season of my life. And although I know Father God, Lord Jesus and Holy Spirit are with me – I have been “swatting discouragement away like flies”. In between jobs and in the process of moving in with my youngest son waiting for the provision I know is coming; and in this transition I suddenly lost my beloved 3 year old Golden Retriever, and friend, Buddy. As I sit here packing up my home office, and continue to fight back tears of grief, and voices taunting me to never make my heart vulnerable again, I cling close to Father God Who whispers to me, “Buddy is fine, he is right here with Me, in My Throne room, at my feet…” and He slowly starts the process of mending and enlarging my heart to receive the next beloved – human or animal – who is in need of His loving, healing touch. I wanted to encourage you today, that what you do matters – a lot – and I appreciate your faithfulness in loving Father’s Kids through your encouraging words. I just wanted to say Thank You for today’s words. It hasn’t been just a hard week, but it’s been a rough a little over 8 months. I am torn and have been for all that time. 25% of me wants to be here. 25% doesn’t and the other 50% is in another place altogether. Most nights I find myself in tears. Please keep me in your prayers. Hi Jarrod, I think we’ve all had seasons where we’ve been where you are. Some seasons are just really hard. I would recommend reaching out to someone safe, like a counselor, as a starting place right now. Counseling and life coaching have both been essential to my healing and well-being and I want everyone to experience those benefits! In the dips of discouragement I can always count on you, Holley, to pull me up, give me a shot of spiritual espresso, and send me on my way again with a smile! Thank you for reminding me today that I must keep hoping and dreaming. God isn’t finished with me just yet! I had a really difficult week at work – under staff, busy week, computer outage, many deadlines, last minutes requests, chaotic meeting, pressure from upper management… things were falling apart (and I can’t break down because of my whole team under me). I felt I was no longer the calm, focused and capable person I was, and I felt I lost my ability to pay attention on details (which used to be my strength). I am completely lost, starting to lose my confidence, and under constant self-doubt.